For years, Nashville has been home for a slew of talented singer-songwriters. And, for years, many of them have found a performance home at the Kennett Flash (102 Sycamore Alley, Kennett Square, 484-732-8295, http://www.kennettflash.org). One of them is Peter Bradley Adams. The Nashville-based singer-songwriter will visit the area on April 9 to headline a show at the Flash. Adams will be sharing the bill with the Lullanas. Adams has developed a reputation for expertise at storytelling. He is known for his use of specific details to set various scenes while keeping the lyrics open enough so that everyone can relate to them. 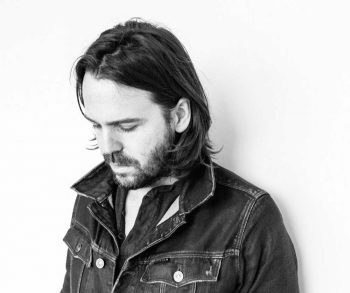 On his new album “A Face Like Mine,” Adams has created his own brand of Americana – a tasty combination of his sincere voice, gentle guitar, tasteful dobro, subtle banjo, supportive bass and unhurried percussion. It is simple musical sophistication at its best. “The new album will come out on April 21,” said Adams, during a phone interview Tuesday from his home in Nashville. “But, I will have copies of it to sell at this weekend’s show. In almost all the songs, Adams sets the stage with his imagery. “The songs just come,” said Adams. “I don’t know how it happens. It seems like I’m always writing a song. “There was no problem with continuity because I used my group of core musicians,” said Adams. “As a result, the sound was consistent. “The consistent sound also came from choosing the right songs. There were some that just didn’t fit and were tossed aside. There were others that I thought were great at first that later got scrapped. And, there were a few that I re-did. “When it was time to put the album, I had 12 that fit – 12 that I really liked. I also have a few that came at the last minute that I could have used but didn’t. Maybe, I’ll put them out as an EP. “I think all the songs on the album fit with the sound – but there is one that goes outside the enveloper. There really wasn’t a theme that I intended when I was choosing the material. 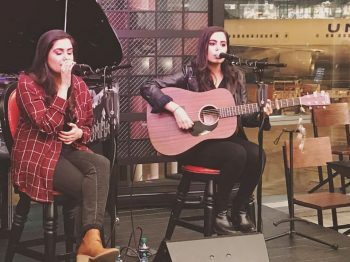 The Lullanas — Atisha and Nishita Lulla — have been singing together since they were little. That performance at Methacton High was the start of a musical career that is starting to flourish. The twins have made a name for themselves by posting their performances of covers on YouTube but they also are emerging as artists with solid original material. Video link for Peter Bradley Adams — https://youtu.be/kbjnF8gHGDU. Video link for the Lullanas — https://youtu.be/uu21J4UH7sQ. The show at Kennett Flash, which features the Lullanas as the opening act, will start at 7 p.m. Tickets are $16 and $20. If you’re in the mood to catch some live music on April 8 or 9 and you’re looking for a good venue, the World Café Live (3025 Walnut Street, Philadelphia, 215-222-1400, www.worldcafelive.com) is a very good choice. Choose the Upstairs Stage or the Downstairs Stairs – you can’t go wrong either way. On April 8, the concert in the big room downstairs will feature veteran singer-songwriter while the Upstairs stage will host a show by TFDI is a three man, acoustic band, consisting of Tony Lucca, Jay Nash, and Matt Duke. 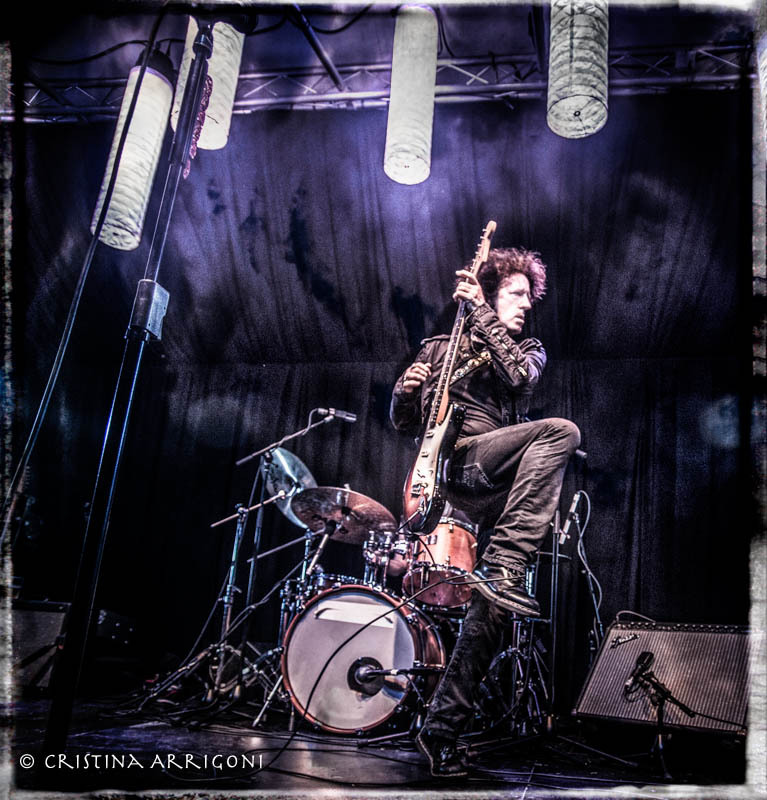 On April 9, rock legend Willie Nile will headline the show on the Upstairs Stage. Meanwhile, sultry singer Morgan James will be the main attraction for the show on the Downstairs Stage. Paula Cole, a Grammy winner, Grammy nominee, mother and activist, has released seven solo albums of original songs during her career which has endured for more than two decades. Her compositions have been covered by a diverse range of artists such as Herbie Hancock, Annie Lennox, Katherine McPhee and JoJo. Cole has sold approximately 3 million albums. Now, Cole is celebrating the 20th anniversary of her Billboard Hot 100 song “Where Have All The Cowboys Gone?” with an updated version and accompanying video. Cole is also continuing her 20th anniversary tour of her “This Fire” album. Released in 1996, it was her sophomore album and, in reality, her first national release. Her debut album “Harbinger” was released on Imago Records, a label that folded just after her album was released. “Fans kept reminding me of the fact that it had been 20 years since I put out the ‘This Fire’ album,” said Cole, during a phone interview Wednesday while taking a break between teaching classes at Berklee College of Music in Boston, Massachusetts. Without question, “This Fire” was the breakthrough for Cole. The album was nominated for seven awards at the 40th Grammy Awards, including Album of the Year, Best Pop Album, “Where Have All The Cowboys Gone?” for Record of the Year and Song of the Year, Best Female Pop Vocal Performance. Cole was also nominated for Producer of the Year (the first woman in Grammy history to be solely nominated as Best Producer) and won the Grammy award for Best New Artist. Now in 2017, Cole is performing “This Fire” in its entirety this year at select performances. Cole’s career has spanned nearly a quarter-century but hasn’t been continuous. Back in the mid-1990s, Cole was a hot commodity in the world of rock music. Her single “Where Have All the Cowboys Gone?” was a smash hit that reached the Top 10 on Billboard magazine’s pop charts. Her next single “I Don’t Want to Wait” reached Number 11 on the same chart and was used as the theme song for the hit TV series “Dawson’s Creek.” Another single was used on the “City of Angels” soundtrack. Cole also recorded a duet with Peter Gabriel on “Hush, Hush, Hush”, a song about AIDS. She received rave reviews for her performances on the inaugural “Lilith Fair” tour and was nominated for several Grammy awards in 1997. Then, Cole pulled the plug on her music career. She took a hiatus from life in the entertainment world for a variety of reasons. Finally, in 2007, Cole decided to resume her career as a singer/songwriter/producer. She released her “Courage” album in 2007 and followed with her “Ithaca” album in 2010. “I took time off to raise my daughter Sky,” said Cole. “My responsibility was to her at that time. Once you have a child, everything changes. “And, I needed a break from the music business. The pop market was shifting away from Lilith type singer-songwriters and going blonde. Darker, intelligent singer-songwriters were sent to the back burner. So, Cole hopped off the train. But, she couldn’t stay away forever. Their patience has paid off with the release of the “7” album in 2015, the live album “This Bright Red Feeling” in 2016 and her 2017 album offering – “Ballads,” an album of jazz/roots cover songs. “Being a mother, I focus mostly on just doing weekend shows,” said Cole, who is also a graduate of Berklee College of Music. 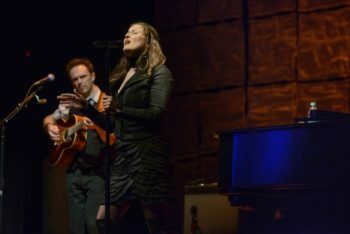 Video link for Paula Cole — https://youtu.be/yQXZBK54oAs. The show at World Café Live will start at 8 p.m. Tickets are $34. One of the most valid seems to be “Totally F****** Doing It” but no-one in the band will say for sure. 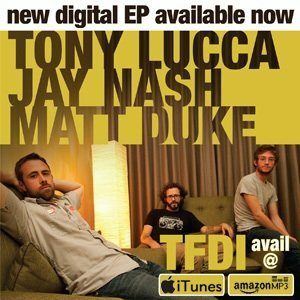 One thing that is certain — TFDI is an acoustic trio featuring three very talented singer-songwriters — Tony Lucca, Jay Nash, and Matt Duke. The three veteran musicians joined forces in 2009 for a co-headlining tour of the United States. Early in the tour, they realized that they possessed a powerful musical chemistry as their three individual sets began to blur into one cohesive concert. “It’s amazing how far back in the rearview mirror that seems,” said Lucca, during a phone interview Tuesday while travelling through Massachusetts en route to a show. “It’s the by-product of a co-headline tour I was doing with Jay. We had brought Matt out with us to open the show. It didn’t take long until we were playing together. On that day off in Chicago, Jake Samuels, the talent buyer at SPACE in Evanston, invited the three to SPACE’s backstage studios to record a few live performances. It didn’t take long to put down takes of the four songs that would become the TFDI EP. “On November 24, 2009, just a few days after its release, the “TFDI” EP reached Number 1 on the iTunes singer-songwriter top albums chart and remained there for weeks. The full-length album “When I Stop Running” was released in the spring of 2011. After 2011, TFDI had a lengthy hiatus. Now, the trio is back and roaring to go. “We got together for a reunion show for a festival last June in Atlantic City,” said Lucca. “We just took up where we had left off. It was like riding a bike. It felt great. The fans were ready for it. “So, we decided to get back in the studio last December. Jay has a pretty fantastic home studio in Heartland, Vermont. He invited us up to work on a new batch of tunes. Video link for TDFI — https://youtu.be/r3En0TywPb8. The show at the World Café will start at 8 p.m. Tickets are $20. On April 9, the World Café Live will present Morgan James, a versatile entertainer who is an emotive singer, a talented songwriter and an accomplished Broadway actress. Her latest studio album “Reckless Abandon” is her first as an independent artist – and her most personal outing yet. She handled co-writing duties on all 12 tracks and sang all her own background vocals. In addition to releasing “Reckless Abandon” and “Hunter,” James recorded a live tribute to Nina Simone – “Morgan James Live” on Epic Records — as well as an EP titled “YouTube Sessions” that featured some of her fan’s favorite covers. She also recorded a tribute to Joni Mitchell’s “Blue,” which can be found on iTunes and YouTube. James has toured the states, Europe, Australia and New Zealand with viral sensation Scott Bradlee’s Postmodern Jukebox. To date, her music videos have accumulated more than 00 million views. She is currently on the road touring with her band. “We’re going to be out for about three months straight,” said James, during a phone interview last from her home in New York City. “Hopefully, we’ll keep touring through the summer and into the fall. “My band right now is piano, bass, drums and guitar and I’m on vocals. Andy Allo is the opener and she’ll sing with me on a couple songs and so will my guitarist Doug Wamble. “My set list has a lot of songs from the new record — which we’re releasing in April – and a couple of my favorites from ‘Hunter.’ I also do a few cover songs. “I’m pretty confident my fans will love the new album,” said James. “There are some songs from ‘Hunter’ that have changed over the years. James attended high school in Modesto, California and then studied at the Julliard School of Music in New York. She earned her Bachelor of Music in Voice at Juilliard. Video link for Morgan James – https://youtu.be/DhbS3BFtXDk. The show at the World Café Live, which has Andy Allo as the opener, will start at 8 p.m. Tickets are $20. New Yorkers consider Willie Nile to be one of their city’s most cherished musical treasures. At the end of the 1970s, Nile established residency at the Greenwich Village club Kenny’s Castaways, which led to a record deal with Arista Records. He released his debut album “Willie Nile” in 1980 and followed with his “Golden Dawn” album in 1981. He didn’t release his next album “Places I Have Never Been” until 1991. Nile then became much more prolific with his music and released four more albums between 2009 and 2014. The veteran musician then upped the ante with the release of the highly-acclaimed “World War Willie” album last year. “I recorded ‘World War Willie’ in January and February last year,” said Nile. “It’s a rocking upbeat collection of songs. I’m thrilled with it. You can feel the band experience. It fits like an old baseball glove. Nile recorded the album with longtime producer Stewart Lerman (Antony and the Johnsons, Loudon Wainwright III, Boardwalk Empire) and his long-time band — Matt Hogan on lead guitar, Johnny Pisano on bass and Alex Alexander on drums. “My live band is a classic four-piece,” said Nile. “John has been with me for nine years. Matt has been in the band for seven years and Alex for four. Jon Weber has been our tour drummer lately because Alex has been out of town. “We’ve done so many shows in the last few years. The band is on fire. When we play, you better call the fire department because we’re gonna burn the place down. “I’m in my ‘Golden Years.’ I’m writing the best stuff of my career. I’m loving it. It’s inspiring music – music that is heartfelt. If I didn’t feel it was going to be special, I wouldn’t walk on stage. Video link for Willie Nile – https://youtu.be/oxdtbzyTpks. The April 9 show at the World Café Live, which has Jamie McLean Band opening, will start at 8 p.m. Tickets are $25. Another area show on April 9 will feature a band that has been around for almost a full decade yet are just making their area debut. Actually, the Rumjacks, an Australian band that is performing at the Voltage Lounge (421 North Seventh Street, Philadelphia, 215- 964-9602, Voltagelounge.com), are making their North American debut. 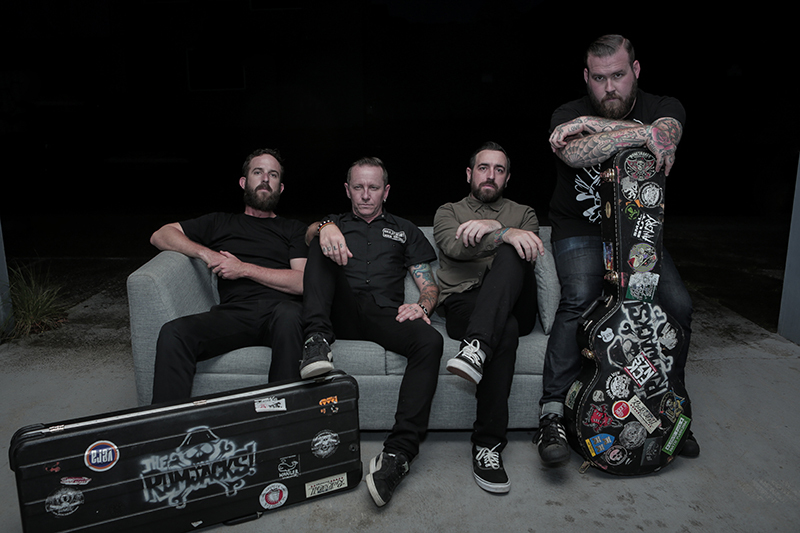 The Rumjacks date back to 2008 when Frankie McLaughlin (vocals) and Johnny McKelvey (bass) got together to form a band that played a mix of punk rock and traditional Celtic folk music. Right now, the Rumjacks are: Frankie McLaughlin – vocals, tin whistle, war drum; Johnny McKelvey – bass, vocals; Gabriel Whitbourne – guitar, vocals; and Adam Kenny – mandolin, banjo, bouzouki, vocals. Their discography also includes three full-length albums – “Gangs of New Holland” (2010), “Sober & Godless” (2015), and “Sleepin’ Rough” (2016). “We recorded ‘Gangs of New Holland’ with a very strict budget,” said McKelvey. “We recorded it live – 16 hours on one day. We’re not a band that looks to be perfect. “The songs on ‘Gangs’ were older songs. By the time we made our second album, we had more time to write songs – and we went in the studio with a producer. “The first album was more raw and the second album was more produced. The third album is a mixture of the two. “We lived in a cottage studio. We set up in one big room sand recorded live. There was enough knuckle-dragging and enough polish at the same time. “In our current live show, we’re playing songs from all three albums. This is our first time to the USA so fans here have never heard any of the songs played live. Video link for the Rumjacks – https://youtu.be/PHkruTw-hiM. The show at the Voltage Lounge, which has Mass Folk Commons as the opener, will start at 8:30 p.m. Tickets are $10. While some venues load up on weekend shows and go light with evening shows during the week, the Sellersville Theater (24 West Temple Avenue, Sellersville, 215-257-5808, www.st94.com) books top-flight acts all through the week – every week. The upcoming week is no different. After a weekend schedule that featured the Grand Slambovian Circus on Friday night and Nashville-via-Downingtown singer-songwriter Liz Longley on Saturday evening, the theater will keep on rocking with shows by John 5 & The Creatures on April 10 and Samantha Fish on April 12. John 5 is a musician with impressive credentials. He has been the guitarist for a number of arena-filling acts including Rob Zombie, Marilyn Manson and David Lee Roth. He is also a solo artist with eight guitar albums in his discography. His most recent album “Season of the Witch” was released last month. “Season of the Witch” is a fully-instrumental album that features his band The Creatures (bassist Ian Ross and drummer Rodger Carter) and showcases experimentation with various genres such as western swing, Spanish flamenco, heavy metal and straight-ahead rock. 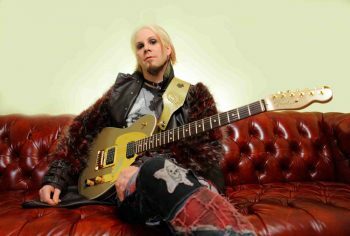 “I’ve been doing instrumental albums on my own since 2004,” said John 5, during a phone interview last week as he travelled from a tour stop in Charlotte, North Carolina to a gig in Greensboro, North Carolina. “What I did with this album, I started with the way people get their music. Last year, I put a song with a video on YouTube. Everyone watches videos. So, I put out one-a-month for six months. “They were getting a million views. I would have never gotten a million spins on radio. When I was done with the videos, I started rehearsing for the tour. Both John 5 and his fans are liking the new album. “I worked very hard on this record because I had time to do it,” said John 5, who has written for acts Avril Lavigne, Ricky Martin, Paul Stanley, Rod Stewart, Lynyrd Skynyrd and Garbage. “I did everything at Doghouse Studio in Woodland Hills (California). It’s a good thing I don’t have a studio in my home because if I did, I would be in there every single minute of my life. “I worked so hard on this album. I didn’t improvise on anything. Everything was planned out very carefully. Every note is what I wanted. “This album is really who I am. I love all types of music – bluegrass, rock, country, metal, swing, hard rock. I love all music. We really have a wide demographic of fans. Video link for John 5 – https://youtu.be/Ov6t1yqrx7Y. The show on Monday night, which has Slik Helvetika as the opener, will start at 8 p.m. Tickets are $25 and $39.50. Samantha Fish is a guitarist. She’s also a talented singer and an adept songwriter. But, more than anything, she’s a guitarist with roots in rock, blues and Americana. This week, Fish is headed to Sellersville with her searing lead guitar style and expressive voice. Her latest album, which was produced by Bobby Harlow, is titled “Chills and Fever.” It was released March 23 on Ruf Records. Fish has music in her DNA. “My dad played and my mom sang in church,” said Fish. “My dad’s friends all played music. They’d come over to our house and play. It was a social thing. My uncles played metal with heavy guitar. My dad’s friends played country-and-western and blues. “I started with drums and did that for a couple years. I’m glad I did because it gave me the rhythmic foundation. When I picked up guitar – that’s when I started singing. Not long after, I started writing songs. Musical diversity has always been crucial for Fish – listening and playing. “I listened to a lot of soul music — people like Otis Redding and Ray Charles,” said Fish. “I was also influenced by blues acts — especially North Mississippi blues — people like R.L. Burnside and Junior Kimbrough. “Currently, I’m playing with a six-piece band. I’ve been doing a trio my entire career – playing with a trio for a decade. I’ve always wanted to have a bigger band with lap steel and pedal steel. I could hear it when I was writing. Video link for Samantha Fish – https://youtu.be/GL9rBAjut2g. The show on Wednesday night, which has Bob Lanza Band opening, will start at 8 p.m. Tickets are $19.50 and $30.